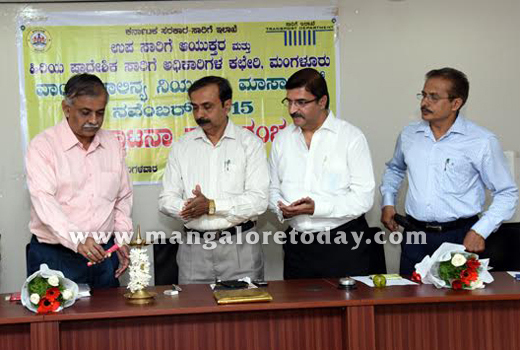 Mangaluru, Nov 03, 2015: A month long drive to reduce as well as control air pollution organised by the Regional Transport Authority, was inaugurated by RN Kulkarni, Assistant General Manager of State Bank of India at a ceremony held at the RTA office on November 3, Tuesday. In his inaugural address, Kulkarni said air pollution has posed one of the biggest hazards in India and stressed the need to keep it under check. Conservation of environment goes a long way in checking air pollution, he said and underlined the need for concerted efforts on the part of the state as well the public in this regard. The extent of air pollution also affects the quality of life, he observed and sought public co-operation for the success of the drive launched by the RTA. The function was presided over by GS Hegde, Assistant Regional Transport Officer. In his address he said vehicles contribute maximum towards air pollution and added at least 4000 vehicles get registered at RTA every month. Strict enforcement of environment protection rules would help in checking pollution levels, he said. Motorists too should incorporate good driving habits. Emission tests should be conducted regularly apart from maintaining vehicles in good condition, he further added. Rajashekhar Puranik, District Pollution Control Officer, said vehicles are responsible for 60 per cent of air pollution. Handbills creating awareness on controlling air pollution were unveiled by Aroor Kishore Rao on the occasion.